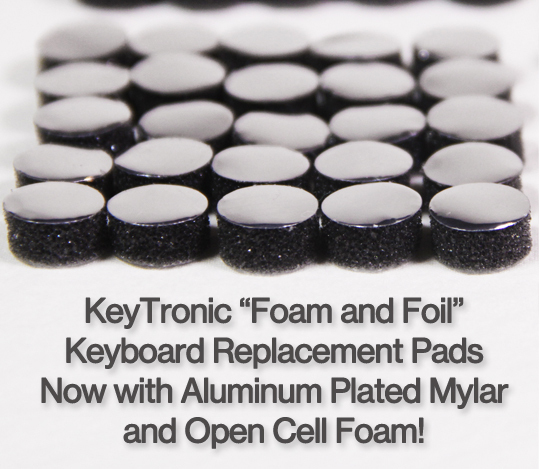 Home / Announcements / KeyTronic Keyboard “Foam and Foil” Replacement Pads are Back! KeyTronic Keyboard “Foam and Foil” Replacement Pads are Back! These new pads have officially been successfully tested on the following computers: Compaq Portable, Apple Lisa and the Franklin Ace 1000. We would love to add your computer to the official tested list after installation. Please don’t hesitate to write a review here on the product listing or you are welcome to just send an email letting us know about your experience using these pads! Our goal is to provide fully assembled pads that require no deconstruction, cleaning, cutting, punching or gluing for all KeyTronic keyboard restorations. All feedback is welcome and appreciated! To see the saga of the pad revisions you can visit this older blog post. It includes links to the vcfed.org forum where the vintage computer community gathered to help me get this all figured out. It also contains photos of the machine Kevin built to help me make these pads more efficiently!